We attended my little sister's modelling culminating activity last week. I felt really proud seeing her walk down the runway and strut her stuff. 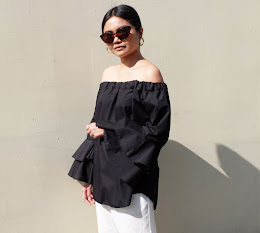 For the event, I wore this sheer top with peter pan collars, pastel pink high-waisted shorts, black bandage shoes and accessorized with a metal plate belt and a vintage Victorian silver bangle from the hubby's grandmother. PS. Want to win a spa session at Beauty & Butter with me? :) Click here for more details.